~ a new company created by the extremely talented Susanne Woods. is something of a legend in the craft book publishing industry, known for making absolutely beautiful books and I was thrilled to have the opportunity to work with her. Scraps, Inc.Vol.1 is a collection of 15 quilt patterns from all sorts of talented designers that I'm sure you will recognize - Allison Harris, Amy Ellis, Lee Heinrich, Amy Smart, Camille Roskelley to name a few! 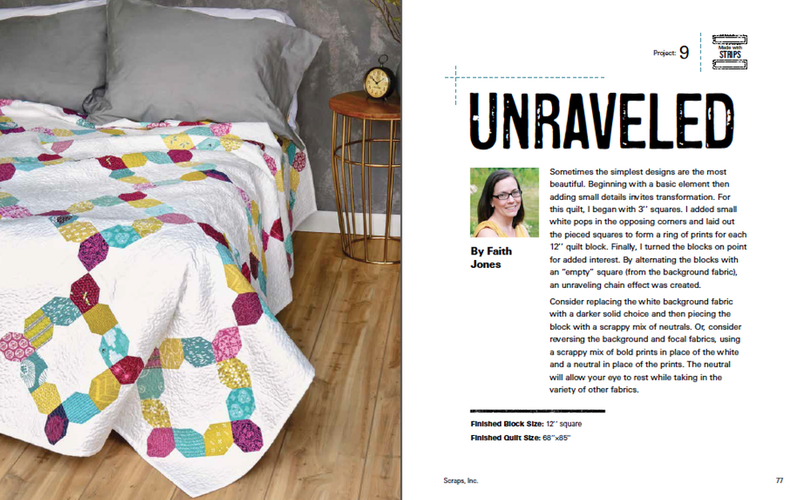 Today I finally get to share my quilt with you, Unraveled. Created last winter, Unraveled is a simple and clean design that has fun with negative space. I know a lot of my patterns are paper pieced...but this one is not. (Some of you are probably cheering right now!) This quilt pattern is great for beginners on up. I used a collection of plum, aqua and chartreuse prints, and I'm quite pleased with the combination. Unraveled measures 68" x 85" and is quilted in a free motion meandering design. Lucky Spool is celebrating the release of Scraps, Inc with a discount for you. For about the next week, you can buy the book directly from Lucky Spool for 30% off using the code SCRAPS30. Just in time for holiday shopping, right? I hope you will check it out!